The office of Acting U.S. Attorney Joon Kim declined to comment this week about the status of the reported Federal investigation into the physical condition standards at the public housing developments owned by the New York City Housing Authority, or NYCHA. Under Acting U.S. Attorney Kim's predecessor, then U.S. Attorney Preet Bharara, the U.S. Attorney's Office for New York's southern district commenced a widely-reported investigation into NYCHA that was described in some press reports as probing allegations that NYCHA's tenants were being exposed to toxic substances, such as lead, possibly as a result of or in connection with false claims made by NYCHA officials. In March 2016, around the time the investigation became public, Assistant U.S. Attorneys Robert Yalen, Monica Folch, and Talia Kraemer filed a Motion to Compel the release of Municipal health records as part of the reported investigation. "Production of the information is in the interest of justice," the Assistant U.S. Attorneys collectively wrote in their motion. In the time since and despite the apparent urgency to the investigation, no material information about the status of the investigation has been released to the public. The lack of information of the reported Federal investigation into the living conditions at NYCHA's public housing developments is taking place as five public officials in Michigan have faced criminal charges related to negligence over their handling of a water crisis in the city of Flint. In London, law enforcement officials have reportedly opened a criminal investigation to probe whether negligence allowed a fire to almost entirely burn through Grenfell Tower, a public housing apartment building. The opening of the criminal investigation in London followed calls by the public, including by David Lammy MP (Labour-Tottenham), that there had to be accountability for the fire that is presently estimated to have claimed approximately 100 lives. It is not known if the actions being taken elsewhere against public officials for negligence that contributes to compromises in public safety over public assets, such as drinking water systems and public housing, would influence any decisions by Federal prosecutors reportedly investigating NYCHA for poor physical condition standards. Such a question was one of a few advance questions that the U.S. Attorney's Office declined to answer for this report. NYCHA tenants have complained of having to live in apartments plagued by mold, lead paint, water leaks, insect and rodent infestations, and other conditions affecting the habitability of apartments. NYCHA is presently under the supervision of a Special Master appointed by the Hon. U.S. District Court Judge William Pauley, who are, together, overseeing a Federal class action case over mold abatement. In respect of the reported Federal investigation into NYCHA, the silence from Federal prosecutors leaves the public waiting for accountability, because the public in New York have come to rely, some say over-rely, upon the work of the U.S. Attorney's Office for any accountability or reform in New York Government. New York City's Municipal housing authority reportedly faces a capital improvement budget deficit estimated to be as high as $17 billion. 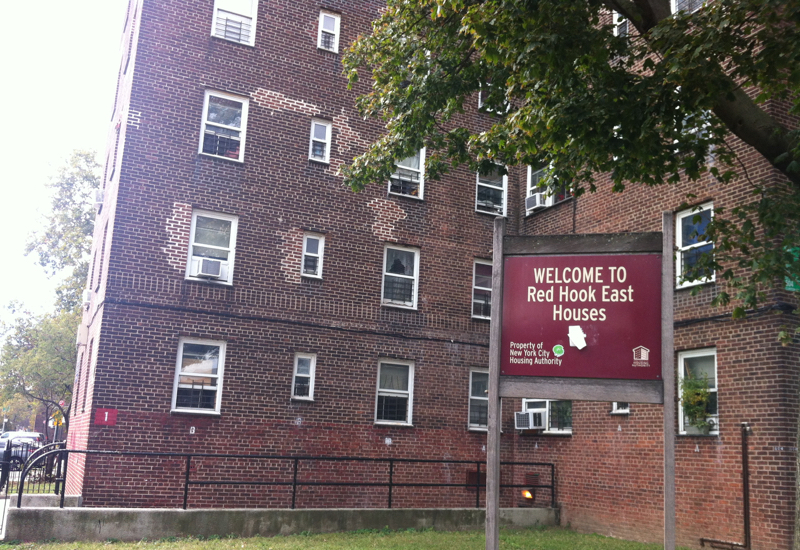 A review of NYCHA's maintenance logs, obtained by Progress Queens in 2016 in response to a request filed under the State's Freedom of Information Law, revealed locations where apartments tested positive for lead in drinking water at thresholds way in excess of levels that would have compelled Governmental action under the Nation's Lead and Copper Rule had the test results exceeded the 90th percentile of Municipal water tests. As reported by Progress Queens, Mayor Bill de Blasio (D-New York City) and New York City Councilmember Ritchie Torres (D-The Bronx) support selling or leasing to private corporations some of the Section 8 housing developments and the parks, green spaces, and parking lots on land owned by NYCHA in order to incrementally raise money in the future to someday address at least some of the poor living conditions at NYCHA's apartment buildings. A report published by Progress Queens in 2015 raised questions about why a cash-poor NYCHA was selling Section 8 apartment complexes that appeared to have been recently renovated. A representative of NYCHA did not answer a request for an interview for this report.